The OpenCom range of communications systems is an ideal solution for small to medium businesses that need a cost effective but modern telephone system that can easily expand. The OpenCom 130, X320 and 150 are small medium business systems ideal for new or growing businesses that require a cost effective but flexible "one box" solution. The OpenCom 510 is a larger system suitable for medium to larger businesses, all are designed with flexibility and easy expansion in mind. Any of the systems may be used as a stand-alone business system in a network or as a DECT server. The Opencom systems are hybrid systems, therefore an OpenCom installation can be initially deployed without Voice over IP (VoIP), then enabled at a later date should circumstances require it. This continuity continues on the handsets too with every system from the smallest to the largest using the same range of desk and DECT handsets. The handsets are easy to use, with menu driven inter-active displays. Every OpenCom has a suite of applications that includes voicemail, auto-attendant, call logging, PC (CTI) telephone management and Multi-company software. All these are licensed applications that can be easily enabled. No additional hardware or software is required, you simply add a license. It really is "easy to use", with interactive menu driven telephones and a friendly browser style user interface, system management or personal telephone management with CTI50. 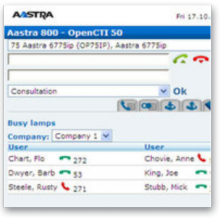 We maintain and support Aastra DeTeWe OpenCom Telephone Systems.